Between big price tags and an overwhelming number of options, choosing wall art is incredibly fun while also being potentially daunting. So I’m here to help! I’ve picked out some DIY wall art ideas that the average human being can construct with minimal supervision (hopefully) and provide a finishing touch to those bare walls to complete your space. Don’t be scared. I cannot overstate the benefit of simply buying a canvas, some paint and brushes, and just letting your creative juices flow. It does not have to be a painting fit for a museum, the art work you create can consist of a brush stroke pattern that you liked and be as abstract as you please, anything goes. If you don’t trust your free hand artistry, you can also use sponges, stamps, tape, etc. to forge a painting fit for your space. 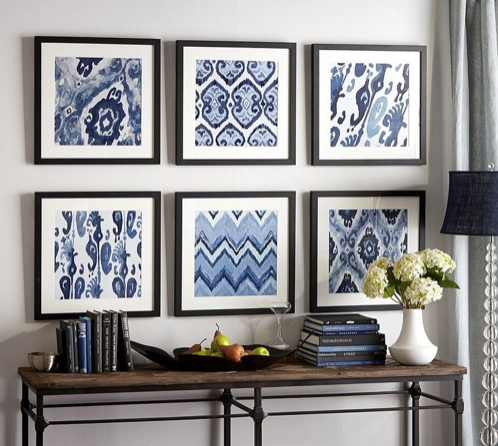 Framing fabric or wallpaper swatches is a cheap & easy way to add some character to your walls with minimal effort. Stapling fabric or wallpaper to the back of Styrofoam or plywood allows you to cut the wall art to any size, and you can even add a monogram to fabrics or use a template to paint one onto wallpaper, if you want to. 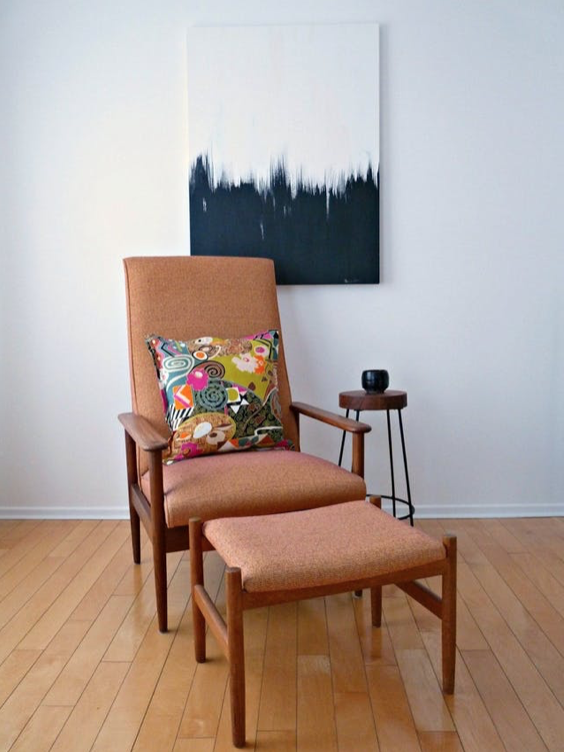 Image Credit: Sukio Design Co. If you’re a little superstitious and don’t want to even begin calculating the bad luck you’d have after breaking multiple mirrors for the sake of design, you can choose to paint over an old mirror (or the glass in a picture frame) with chalkboard paint to create something completely different. With this new creation, you can use chalk to doodle, make to-do lists or whatever else sparks your creativity, hang it on the wall and boom! Art meets function. This one may take a bit more time and effort, but it’s certainly a one-of-a-kind art piece & an amazing way to incorporate nature into a space. Use a picture frame sized to fit your space (I recommend smaller rather than larger so the piece doesn’t become too heavy to hang) and create a miniature garden of whatever succulents you choose. Succulents require very little water and sunlight to survive, so they are the perfect plant to live indoors – and on your wall. Click here for instructions on how to create your own hanging succulent wall art. Also, if you want this look but are a bit timid about having a real-life garden hanging on your wall, you can create a similar look by substituting the real things for replicas (i.e. fake succulents). No shame in faking it!